“The workshop engaged us in jointly refining the TEEB study, so that it can support decision-making in the framework of the transformation of the Productive and Energy matrix,” said Francisco Prieto, Undersecretary for Natural Heritage of the Ministry of Environment of Ecuador. “The cross-cutting drivers characterizing the policy scope of the TEEB study help us bring various actors to the same table. The development of an ‘Environmental Economics and Financial Sustainability’ unit within the Ministry of Environment will strengthen our role in this process.” He also praised the two TEEB host institutions – the public universities ESPOL and EPN – for their key role in bringing in knowledge of biophysical sciences, economics and modelling tools to bridge science-policy gaps. Notwithstanding the significant progress over the last decade in incorporating natural wealth in the country’s overall development vision and policy instruments, the recent economic crisis in Ecuador has put pressure on the public purse, and particularly on public sector spending on nature conservation. TEEB Ecuador will make the case for continued investment in conservation, restoration and sustainable use of biodiversity and ecosystems. This is aligned with the “rights of nature” and “Good Living – Buen Vivir” as enshrined in the Ecuadorian Constitution. Central to this thinking is the aim to create a society where people conserve nature for its own sake, while emphasizing equitable access to natural wealth and services, particularly for vulnerable sections of the population. Nature’s values often go unrecognized by decision makers across society, be they businesses in the form of hydropower, the agri-food sector (including farmers), or policy makers. In Ecuador, large hydropower and irrigation infrastructure projects were implemented to set the country on a transformation path of its productive matrix and energy matrix. Stakeholders emphasized the need to demonstrate the dependence of these infrastructure projects on Ecuador’s natural wealth. The EPN university is conducting a pilot study in the watershed around the hydroelectric Coca Codo Sinclair, which is intended to meet 15.4 % of the future electricity demands in Ecuador. Workshop participants discussed technical issues around the biophysical modelling and economic valuation exercise, looking at four scenarios of priority conservation activities and alternative financing levels, including funding from the hydroelectric sector. Zack Romo, leader of the Socio Bosque Programme, sees the importance of the TEEB analysis in “both providing evidence on the benefits of sustained financing of conservation programmes such as Socio Bosque, as well as having a solid science base for introducing finance mechanisms from hydropower companies to integrate management of hydrological resources at the wider landscape level.” He further appreciated the fact that the analysis captures socio-economic variables, and thereby aims to improve the resilience of rural communities as a cost-effective strategy for climate change adaptation. UNDP Biofin and GIZ ValuES (present at the workshop) also expressed their support for the TEEB policy assessment. The pilot area for the study currently conducted by the ESPOL university is the influential area of the Dauvin irrigation project, one of the emblematic infrastructure projects that is intended to facilitate transformation of the productive matrix in Ecuador. 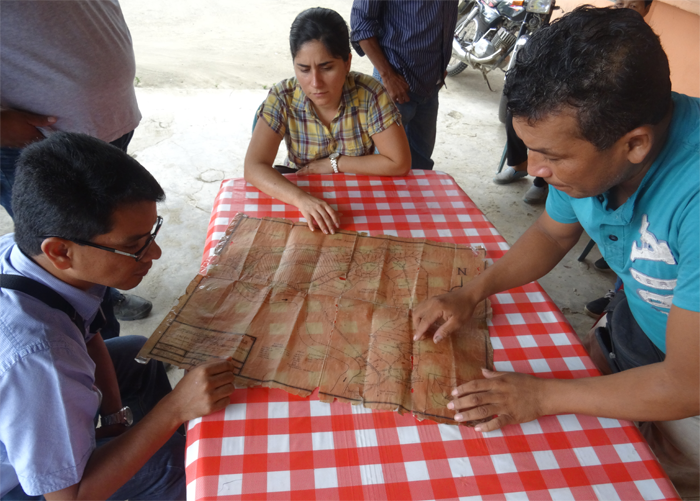 During a field visit to the Guayas watershed, cocoa smallholder farmers voiced their high expectations for the potential benefits of the irrigation infrastructure that was completed in December 2015: “Markets are asking for high quality cacao and, although the soil is very fertile in this region, we are struggling to increase productivity without harming the environment”, says Carlos Luna, President of the Cocoa Producers Association La Fortuna. “We are already seeing multinationals showing interest in investing in the area”. TEEB will analyse the impact of different policy scenarios on increased productivity and local livelihoods in the cocoa sector that is prioritized in the country’s productive matrix change. “We want to know the impacts of different practices in the region on soil fertility, water quality and the quality of cacao”, remarked Juan Aguiar, a technical officer in the Ministry of Agriculture. “This would help us identify policies that promote sustainable production systems, especially for the high quality national cocoa variant ‘Arriba’. We started already at the Ministry of Agriculture to promote cocoa cultivation and are offering technical assistance to increase the production in this area.” Paul Herrera, TEEB Ecuador Coordinator, further points out that “the presence of heavy metals such as cadmium can lead to human health impacts, as well as future trade implications given the new EU regulation to be implemented January 1st 2019 . The TEEB study may provide the necessary policy evidence to address this issue”. » Report on the integrated bio-physical/valuation assessment – change of energy mix (October 2016). » Presentation at ESP LAC Conference, Cali, Colombia #esp2016lac (18-21 October 2016). » Report on the integrated bio-physical/valuation assessment – change of productive matrix (November 2016). » Final TEEB Country Study International workshop, Cancun, Mexico: share country specific results with international community and discussion on strategies to communicate finding and implement recommendations of the TEEB Country Study. (December 2016 – dates TBC). » Side event at CBD COP 13 (tbc) “TEEB Country studies – progress in recognizing, demonstrating and capturing value” (4-17 December 2013). » Synthesis report TEEB Ecuador (December 2016). The change of productive matrix represents a paradigm shift from an economy based on the extraction of non-renewable resources and the export of primary commodities towards a diversified economy based on added-value products, technology, human capital, and ecosystem services. The change of energy matrix focuses primarily on the substitution of fossil fuels with hydropower.